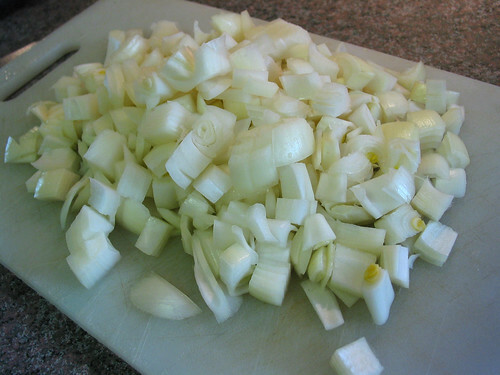 Prepare the onion by cutting it into 1/2-inch chunks. I cut 2 large onions here because I am cleaning out the fridge. 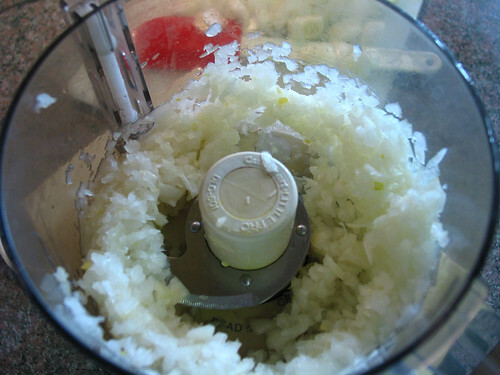 Use a food processor to chop the onion finely. 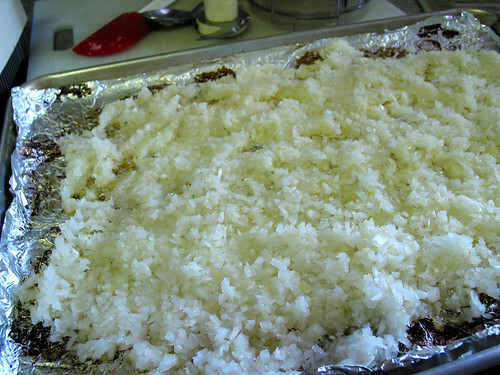 Spread the onion out on a greased foil and put it on a large baking dish. 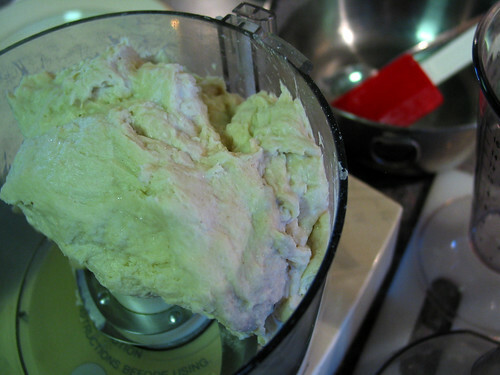 Without rinsing the food processor, use it to mix the dough. Put the dry ingredients in the food processor and pulse a few times to blend them together. While it’s running pour water in stream and continue mixing until dough comes together, a few minutes, if your food processor allows you to do so. Mine is a tiny food processor (a 4-cup size) so I mix it in two batches and it works fine. Take the dough out and knead for a few minutes to cool the dough and then put it back in the food processor to process for another minute. 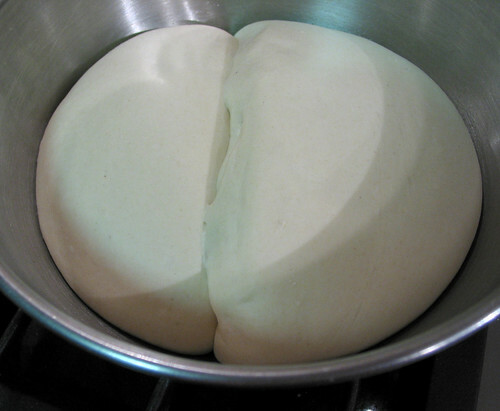 Do this a few times until the dough is smooth and strong. I cut the dough into four small pieces to fit them evenly in my ‘petite’ food processor to process the second time. Note: My food processor has a guarding mechanism that automatically shuts off before it gets overworked. It needs to rest for a good 5-7 minutes before it can resume working. When I mixed this dough it never got too hot before the machine shut down. I took the dough out and kneaded it on a lightly floured counter a good number of strokes until the dough feel strong and smooth and called it good. The dough was very easy to work with. Let the dough proof in a covered large container 3 times its size until it well expands, is light and beautiful. It takes about 2 – 2.5 hours. In the meantime bake the onion at 375 ° F and cook until it’s lightly caramelized. Turn it 2 times or so and rotate the tray half way into the bake so it cooks evenly. Let it cool completely. 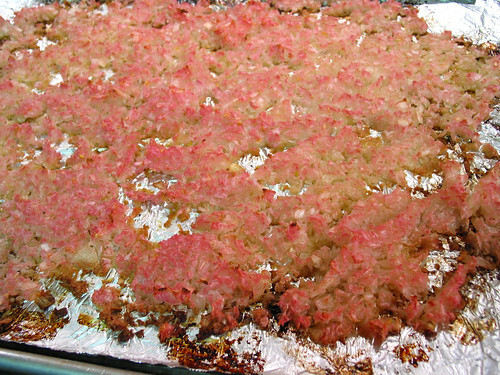 Mine turns out kinda pretty pinkish; I think it’s because I re-use the piece of foil that was previously used when I roasted red beets and so the onion somehow takes on the beet’s color. I re-use foil (and parchment paper) a few times and recycle it afterward, don’t you? 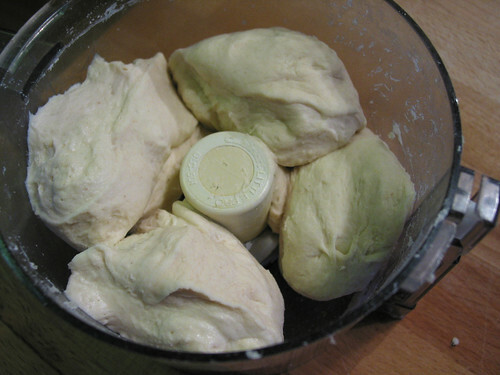 Divide the dough into 12 pieces, 80 grams each. Shape them into tight balls and let them proof until well expanded, filled with air bubbles and depressed when pressed slightly, about 2 hours at room temperature. About 45 minutes before the bake, pre-heat the oven with a baking stone at 475 °F. 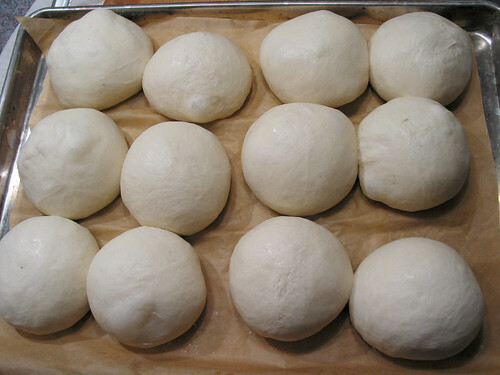 Flatten each dough ball with the palm of your hand and stress it out to 5-6 inch circle, thin in the middle and thick around the edge. I flatten the doug in to a circle as best as it could stretch, pick it up at the edge with one hand, let the dough hang down and start to rotate the dough using the other hand to guide the middle part. Gravity does a good job here to greatly help stretch the dough out to a large circle, thin in the middle and thick around the edges. Put about 1/2 teaspoon of the caramelized onion in the middle, press it down a little bit. Repeat with the rest of the dough balls. Place 6 dough circles on a piece of parchment, cook them on parchment on the pre-heated baking stone for about 12-14 minutes until it takes on some nice brown color. Cool them on a wire rack. Repeat with the other 6 pieces of dough. I took the parchment out and rotate the bread half way. I think the bottom get cooked better. How does it taste? Well, it’s very good bread –as good as bread made with commercial yeast goes– with a crunchy crust and chewy crumb. 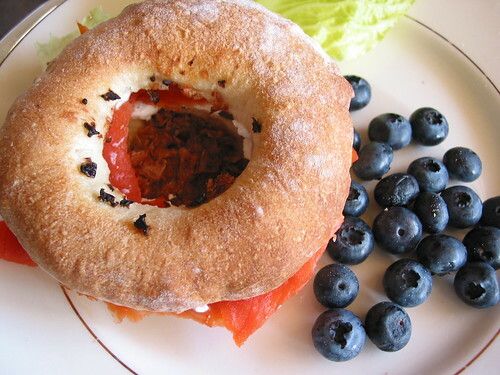 I like it better than bagel, really! 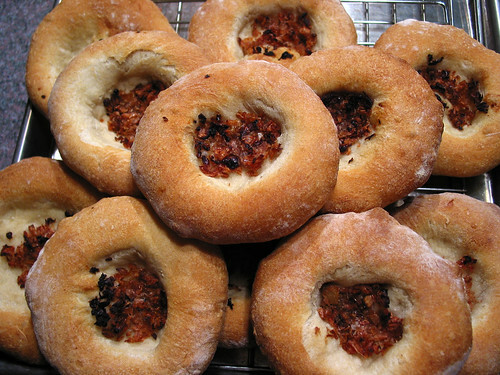 So I made bialys for the first time and will make some more. It was fun and not too much work. It would be a decent recipe to teach people new to bread baking and kids would definitely have fun helping out. I am sending this to this week’s Yeast Spotting. See you there.